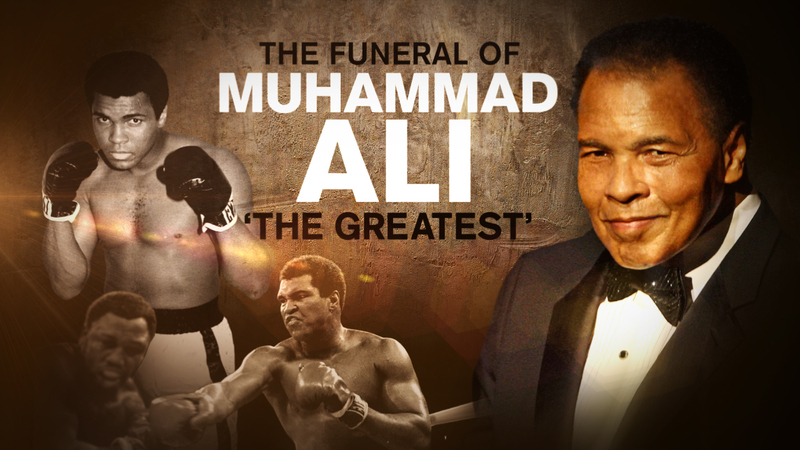 LOUISVILLE, Kentucky -- Muhammad Ali will be honored in an interfaith service in Louisville, Kentucky on Friday, a week after the three-time heavyweight champion known for his showmanship, political activism and devotion to humanitarian causes died at the age of 74. ABC News will provide live coverage online and on television. A Muslim funeral service on Thursday, known as Jenazah, began the two days of memorials that Muhammad Ali crafted himself in exacting detail years before his death. He designed them with the intent to make them open to the world and to offer a view into a faith many Americans know little about. Thousands attended the jenazah, where he was repeatedly feted as "the people's champion." Ali made his final journey through his hometown Friday morning - past the little pink house where he grew up and the museum that bears his name - as thousands of mourners along the route pumped their fists and chanted, "Ali! Ali!" for the former heavyweight champion of the world known simply as The Greatest. The 17-car motorcade carried his cherry-red casket to a Louisville cemetery on a 19-mile route via Muhammad Ali Boulevard and past the gym where he learned to box. Ali famously joined the Nation of Islam, the black separatist religious movement, as a young boxer, then embraced mainstream Islam years later, becoming a global representative of the faith and an inspiration to Muslims. An interfaith memorial service, which will include representatives of several religions, was delayed until 3:00 p.m. EST after the procession to Ali's final resting place took longer than expected. - Former Kentucky Gov. John Y. Brown Jr.
Coverage of the funeral procession and memorial service may affect daytime programming, including General Hospital. The episode originally scheduled for Friday, June 10th will now air Monday, June 13th. Check your local listings.